At the time, Boeing took the unprecedented step of outsourcing most of the Dreamliner's manufacturing. [Korea, Japan, Italy, France, U.K., Canada, Sweden] Boeing had previously designed and built its planes in-house, bearing the whole expense. But... when air traffic plunged after Sept. 11, top Boeing executives balked at investing more than $10 billion to develop a new plane. Instead, suppliers would independently bankroll their part of the project, sharing costs and risk. Investors liked the idea. Boeings stock price jumped from $31 per share in August 2003 to a high above $107 in July 2007. (Here’s the good part) But when factory workers here (US) started assembling the first Dreamliner, the systems flaws became clear as quality suffered and major components weren’t completed. ...Boeing which had earlier culled its own engineers to cut costs, was stretched too thin to monitor and fix blunders. Why bring this up on an art blog? It again exhibits the fundamental flaw in a shortsighted approach to business that puts investors and corporate profits above all other considerations. The long-term cost of such short-term gains, not only negates the windfall, it has broader reaching human and economic repercussions. Furthermore, it is another example of corporate mismanagement that shows the motive for decisions is not product quality and safety but the lean production process intent on minimizing expenses to increasing profit at all costs. The costs however abound. From a business standpoint, there are the delays in product delivery, lost orders, financial overruns, the un-forecasted expense of re-engineering and modifying the errant components. Then you’ve got the issue of quality and compromised safety that could effect future orders, loss claims and the potential human cost of unsafe and inferior products. This business model is also an example of the flawed notion that outsourcing for cheaper labor is good for the bottom line. However this example illustrates how these economic decisions can have a negative effect in the long run. The broader effect on the economy is evident as displaced American workers are left to take money from the government (In case you’ve forgotten: gov’t = me and you.) stripping them of the ability to feed back into that very economy. It’s a one-way money trail that starts from the bottom up before finally touching down on foreign soil. In the case of Boeing at least, the foreign soil is friendly. So, to bring this back to what this has to do art. My latest work showcases what happens when while searching for a bargain, we fail to see the cost of that savings. Oldsmobile, Pontiac and most recently Saturn all have been discontinued putting thousands of Americans out of work and out of home. The tremendous strain on the economy is far reaching. The burden placed on our government is one that we can feel ourselves right now and one that will linger into our children’s lifetimes. If you don’t yet see this as a serious problem worthy of attention and action… then you are part of the problem. These paintings are a way for me to put these ideas out “there” in a forum of contemplation and discussion. By presenting this subject through the use of nostalgic imagery it allows for a dialogue to take place that hopefully will open a few eyes to the problem and more importantly a solution. Finding time to paint between breakfast, work, dinner, baby, dishes and life duties has proven daunting. I’ve taken to working after dark by the light of a mix of cool and warm colored incandescent candles in my makeshift underground studio. After kissing my baby and my wife goodnight I descend to the shallow, quiet, modestly ventilated sanctuary of my studio. I pop the cork of another bottle of red to help me escape the weight of the day that looms on my shoulders. Process takes up a significant portion of the early stages of each session, which allows me to arrive at the “right” state of mind. The spirit creeping through my veins un-inhibits my otherwise tightly controlled psyche, loosening my reservations and freeing my hands to do what they need to do. By the time I reach this point I’ve already toiled over the architecture of my approach and have no need for further unremitting deliberation. Over and over in my head I’ve already executed each painting dozens of times before actually approaching the canvas with a brush. By the time I commit brush to palette the idea is sound and the composition is set. 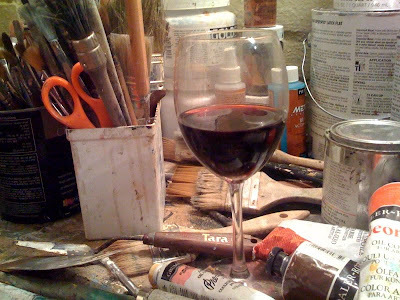 I’ve found that painting sessions become focused and productive under the influence of some mashed grapes. Now, don’t go and get all AA on me … I’ve found the freedom to execute my ideas in the past without help from the vine. This time however, the help is much appreciated and much enjoyed.